Today at PBS Booklights I’m talking about three picture books with surprise endings. One of those titles I’m sharing here, because I’m ready for a discussion. 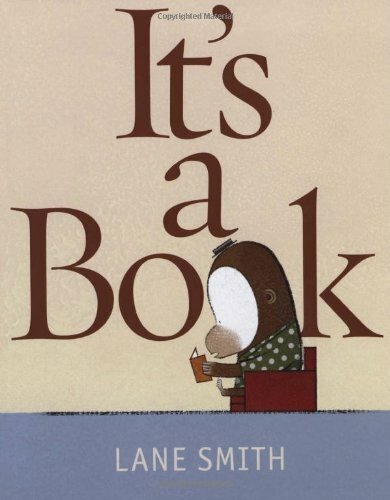 There were lots of raves for the trailer for Lane Smith’s It’s a Book. (You can see the trailer at that Amazon link.) The concept of talking about a book as not being electronic may certainly be enhanced by the irony of watching the video on one’s computer. I get that. But it’s bothered me since I first saw the trailer that it doesn’t contain what makes the book... special. See, I’m not sure that I’m okay with that ending in a practical sense, as in actually wanting to read it to my niece. I guess I can respect it as a choice in the name of Art and Literature, and I suppose that is where all the amazing reviews are coming from — Horn Book, Kirkus, The New Yorker, and so on. But if you look at the Amazon reviews, mainly from parents, you’ll find a more divided group. Even reviewers giving the book three or four stars often said something about the use of the word jackass and questioning whether they would want to read this book to a child. Some pushed the title as being for older kids or even adults. But is that what we’re lacking? A picture book for adults? Others questioned whether school libraries would want to own it. Again, because that’s what librarians need: more issues. Without that bit, it’s a good book with a commentary on our electronic age. The illustrations are engaging, and there’s humor in the story and the concept. But jackass? That gives me pause.